As a teacher, do you ever see students fearfully entering your classroom with pre-conceived notions of distress surrounding your discipline? Have you ever observed students, who felt like they just had to struggle through a course because it was part of your degree requirement? If you peeked into Jane Raycraft’s first year accounting course, you might be surprised to find a class of outdoor recreation students, who look like they are having fun as they eagerly collaborate to solve the challenge of the day – in accounting! There’s no high tech, just calculators, a thoughtful review question, and an engaged instructor, who is running around the room to see who can first show her the correct results and win the chocolate prize. Yes, learning, and teaching, accounting can be an enjoyable experience. I meet Jane in her office in Cedar and immediately feel welcomed and at ease. She teaches one of the five sections an introductory accounting course (BFIN 141 and TOUR 116), a Cap Core numeracy course and a requirement for first year business and tourism students. You get a smile out of a student and your job is so much easier, she says. Dressed in a red blouse, bruised from cross-country skiing with her happy dog on the weekend, personable and funny, Jane exuberates a deep care for her field, her students and for making learning enjoyable. So, how do you make accounting fun? I wonder, as I glaze over the heavy brick of an intro to accounting textbook on Jane’s desk. I bring them in with games, it’s effective and it lessens the intimidation, she says, as she explains how she uses the snowball technique as a fun way to get students to solve and share an accounting problem while they get up and moving. Or, how about cutting up a financial statement and turning it into an actual puzzle? Jane shows me the puzzle pieces the students had to put together in her last class. They work in pairs, they are engaged, they love it! Accounting should be experiential, she says as she goes on to tell me about the chocolate transaction, her favorite activity to do with students (and who can’t relate to chocolate!?) Students are divided into buyers and sellers, they meet in pairs to work through the complex sale of chocolate, recording the transaction, using different accounts, but the same numbers, creating great learning moments as they go. That sounds pretty cool! I’m intrigued. I’m even considering taking an accounting class again – just for the fun of it! But behind the fun and games, I also sense in Jane a purposeful attention to learning, and a deep ability to understand her students. Many of them are terrified of math and they see accounting as a topic removed from anything they have experienced or can relate to. Perhaps that’s why Jane is so passionate about making her classes both experimental and relatable. As it turns out, her first stab at teaching was quite experiential too. When I started 12 years ago, I was an accountant and had no teaching experience and no training in teaching. My partner happened to be a ski instructor so I talked to him and adopted what I would characterize as a “ski-instructor-pedagogy”. I smile. It sounds familiar. But then wait! Maybe ski-instructor-pedagogy is a good foundation for a teaching career. In fact, in the book Small Teaching[i], James Lang discusses the need to help learners engage in mindful practice (not just practice) and compares the teacher’s role to that of a ski instructor, who will ski behind students as they practice, give feedback, monitor progress and gently push them to remain open to the next challenge. Perhaps this is not so different from engaging alongside students in practicing accounting through games and giving immediate feedback? Maybe the ski-instructor-pedagogy is exactly what makes Jane’s teaching both enjoyable and effective. 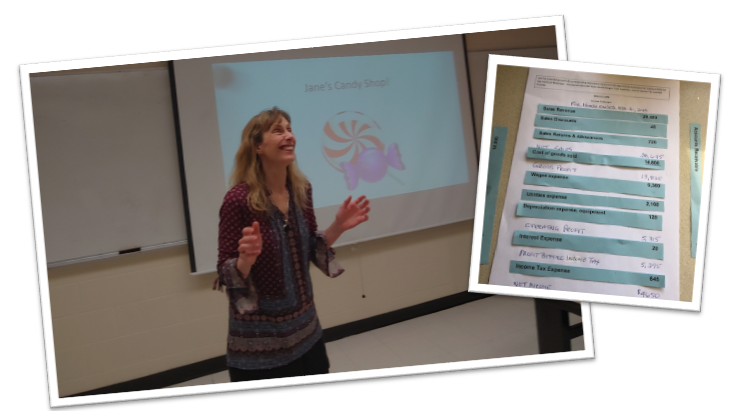 While Jane emphasizes collaboration in her classroom, there is another aspect of collaboration, which may be the very reason she is at CapU today and why she’s been able to build on her initial ski-instructor-pedagogy approach. When I reached out to Jane about a spotlight article, she immediately pointed to other equally fabulous, caring, creative colleagues. I have the honour of working with three other fantastic instructors, Sue Hogan, Tammy Towill and Leigh Oikawa on a common course, she told me. While we each have our own teaching styles, we work together to create common, experiential assignments and ensure that common learning objectives are met and evaluated fairly between all sections. As I meet Jane and she talks about her colleagues, I am starting to understand why the collaboration and collegiality she experiences is so important for her to highlight. We collaborate as a team. By doing so we are both helping each other and students learn. For example, realizing that coming to office hours can be intimidating for students, the four of them recently started an “Accounting Cookie Corner” for all sections of BFIN 141 on Thursday afternoons, where students can drop in, eat cookies and the instructors take turns hanging out and helping students. Teaching can be an insular experience, she says. It is a very special feeling to be supported by wonderful and competent colleagues. The team stays connected via email and will meet at least once after each term to compare test results, share experiences and challenges and discuss any adjustments needed to how they teach the specific modules of the course. We will find time to meet, she says, and I sense in Jane’s heartfelt description of the trust and respect amongst this group of instructors an even more profound benefit as she confides: Instructors get battle weary. It’s so inspiring to see how others care. And you realize, wow, I do care a lot too! My mind is racing now. I see the will and the capacity for this kind of collaboration and support everywhere among CapU faculty. So how do you get started? Jane’s advice is straightforward: Just start sharing cases and problems. It sounds easy, however, Jane admits, it does require faculty members, who step up to mentor and who model this kind of sharing. For her team, Sue Hogan was that kind of mentor and Jane is full of appreciation for what it has meant for her team and for her personally to be mentored by Sue over the years as she has grown into her own instruction and teaching style. I leave Jane’s office inspired by a highly respected teacher, who is confident in her own style and the effectiveness of what may on the surface just be seen as fun and games. Yet, just as inspirational as the activities she does in the classroom, is her conviction that it takes a village and very few of us excel in isolation. Sharing challenges and working together on problems makes learning fun and rewarding, and I’m reminded that while teaching may be an isolating experience, learning is not – whether you are a teacher or a student. Which faculty/department are you in? How long have you been teaching at CapU? How many sections do you teach? Favorite thing to do when you’re not teaching? [i] Lang, James M. (2016). Small Teaching: Everyday Lessons from the Science of Learning. San Francisco, CA: Jossey-Bass. Congratulations, Jane! What a wonderful synopsis of your general amazingness. I love that you were recognized in this way. You have such a welcoming and kind way with students and they always feel comfortable when learning from you. Plus you’re hilarious in accounting class. Congratulations, Jane. A supportive colleague, a gifted teacher, and a wonderful person to collaborate with! Whether it be teaching or administrative duties, you do everything with commitment, integrity, and attention to the small details and the big picture. You are a pleasure to work with.